Sophisticated and elegant, this short v-neck homecoming dress is sure to impress at any semi-formal event. Beautiful rhinestones and beaded accents adorn the stunning v-neck bodice of this little party dress. Multiple thin embellished shoulder straps transition over the shoulders before securing across the open-back detail. An illusion inset provides added support and coverage to the wide v-neckline of the semi-formal party dress. 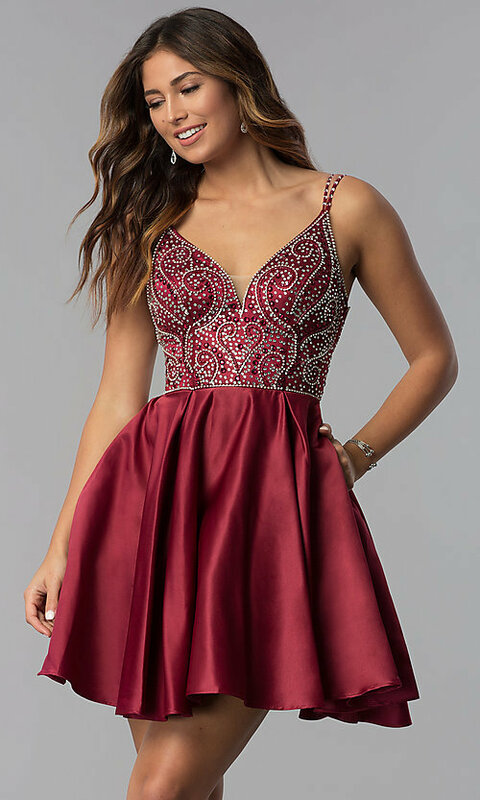 Priced under $150, this open-back hoco dress features a short skirt with volumizing box pleats, a tulle and satin lining, and convenient side pockets. To paint a picture of poise and grace at any semi-formal event, slip into this short v-neck homecoming party dress. The model wearing burgundy is 5'9.5".